In the age of social networking abundance, with sites like LinkedIn and Twitter providing constant industry updates and opportunities to connect, it can seem as though all our professional networking needs are already met. However, joining a simulation-related, in-person networking group and attending events can provide benefits in addition those available in purely virtual settings. Connecting with fellow members of the healthcare education industry provides the opportunity to learn from the unique experiences of others, as well as share experiences of our own. Any healthcare-related professional gathering or association provides this, but getting involved in a simulation-specific group can provide benefits you won’t find in a more general healthcare education professionals group. Lance Baily, founder and Chairman of the Board of SimGHOSTS (The Gathering Of Healthcare Simulation Technology Specialists), finds simulation networking groups to be a good place to learn from the diversity of experience of simulation professionals, who often find their way to the niche field after having worked in other industries. While SimGHOSTS is an international U.S.-based organization, smaller, more local networking groups still provide the valuable opportunity to connect with and learn from fellow simulation professionals. Based in Western Pennsylvania, Pocket Nurse® is a co-founder of SimPOW, the Simulation Alliance of Pennsylvania, Ohio, and West Virginia. 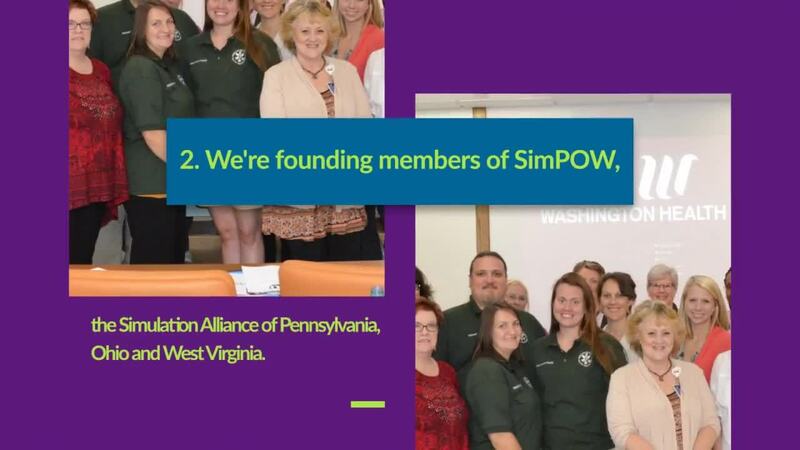 Pocket Nurse’s membership in SimPOW involves hosting educational luncheons and meetings, sending team members to attend gatherings, and networking with local simulation professionals. Not only does this involvement help Pocket Nurse better understand the needs of the simulation educational industry, it also gives team members a chance to get to know and learn from the professionals in the area. Take the time to do an online search for healthcare simulation groups in your area – you may be surprised at how close a networking opportunity is. Networking: As has been mentioned, networking is the obvious benefit to joining a professional group. Having a basis for conversation, like an event topic, can help break the ice between you and professionals you’d like to work with or learn from, allowing conversation to blossom naturally and professional connections to solidify. Educational Opportunities: Besides the fact that gatherings sponsored by businesses (like the upcoming SimPOW meeting on November 16, hosted by Pocket Nurse) typically feature guest speakers and lunch-and-learns, by attending a networking event you could hear about upcoming educational events that you or a member of your staff could benefit from attending. Jobs: Members of networking groups often share job openings with the fellow group members (sometimes even before the job is posted publicly!). Furthermore, industry acquaintances can go a long way in securing an introduction or interview with a professional or organization you admire. If you’ve looked for local networking groups and haven’t found any in your area, don’t despair. You can still benefit from subscribing to trade publications and simulation-focused content, like the SimTalk Blog or HealthySimulation.com. And, if joining a simulation networking group is something you’re passionate about, consider gathering some colleagues and starting one of your own. Pocket Nurse is on Twitter, @Pocket_Nurse, LinkedIn, and Facebook. You can subscribe to SimTalk Blog here.